The next time you visit the refurbished Blue Line station at State Street, consider the new features — rolling ceiling panels that evoke ocean waves, inlaid medallions inspired by Revolutionary War brass buttons — but keep an eye out for genuine signs of the past as well. If you look into the pit, the wall that rises from the tracks to the platforms is hardly smooth. Like an archeological layer cake, it hints at the history of the station, which opened in 1904. Although the Blue Line is now a heavy-rail subway, it spent its first two decades as a trolley service similar to the Green Line — with an overhead catenary, instead of an electrified third rail, and with the platforms closer to the track. The subway platforms were erected on top of the trolley platforms, and you can still see the old ones peaking out slightly underneath, forming a lip near where the pit lights are mounted. Terry McCarthy, the MBTA’s project manager on the $68 million renovation, pointed that out to me during a tour after the station ribbon-cutting last week. Afterward, we went to a nearby field office for the contractor, Barletta Cos., where McCarthy removed the protective covering on a 1904 plaque that the T plans to install soon on the Blue Line platform. Not long ago, it was so tarnished and encrusted that few even noticed it. Now, it gleams with its original grandeur. The plaque salutes the famed East Boston Tunnel, ordered by the Legislature in 1897, begun at Maverick Square on May 5, 1900, and opened to trolley traffic Dec. 30, 1904, with a nod to the governor (Walcott), the mayor (Quincy), and the Boston Transit Commission members at the time of inception. The tunnel — which opened with a parade, a banquet, and 32,000 first-day riders — and the trolleys that ran through it revolutionized travel for people in East Boston, Chelsea, and Revere, who previously relied on a sluggish ferry in between trolley trips on both banks. 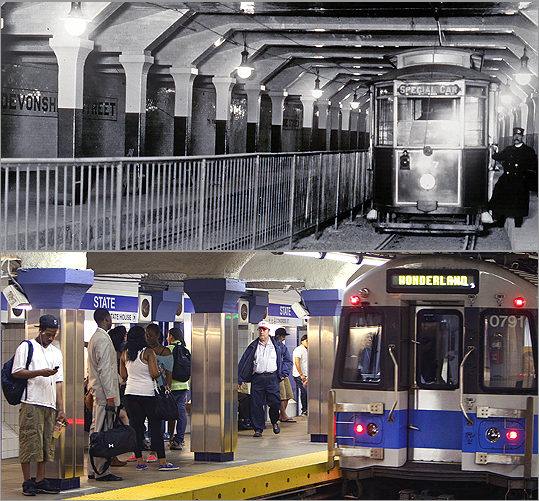 Although State was not the first stop on either side of the tunnel, officials put the plaque there in 1904 because it was the central station where riders transferred to what would become the Orange Line, said transit historian Bradley H. Clarke, president of the Boston Street Railway Association, which encouraged the T to restore the plaque. When it opened, State Street was called Devonshire, and today’s Aquarium Station — which also provides a glimpse of the old trolley platforms — was known as Atlantic Chambers. On the Eastie side of the tunnel, the current Maverick Station was not a formal stop but merely the portal where streetcars dipped into the tunnel, said Clarke, who provided a photo of “Devonshire’’ just before it opened. In the picture, the conductor leans out of the streetcar in his heavy wool coat. You can see the same pillars that still stand today, albeit now sheathed in stainless steel. The answer? Well, he is not the president’s driver, as a seventh-grader asked him on a recent classroom visit. As transportation secretary, LaHood, a former Republican congressman from Illinois, presides over a 55,000-employee agency with a $70 billion budget, responsible for everything from commercial bus safety to high-speed rail. After commencement, he sat down for an interview in the men’s hockey locker room, on a couch opposite the Beanpot trophy. A condensed, edited transcript follows. Q. Stopping distracted driving has been a hallmark of your first two years in office. Tell me about the campaign. A. This is a real, real serious safety problem in America, and the reason I call it an epidemic is because everyone owns one of these [he holds up his phone], and people think they can use them wherever they’re at, including behind the wheel of a car. I was just on a little trip out West, and we were driving down the road, and there’s a woman actually with it in her hand, she’s got her knee on the wheel, she’s going about 60 miles an hour. And what I am happy about is now I think 32 or 33 states have passed laws. I know Massachusetts has passed a law. It’s probably not as comprehensive as other states’, but at least they’ve taken the first step. Q. Massachusetts has a texting ban, but it is not widely enforced, partly because of the difficulty of determining if someone is legally dialing or illegally texting. Is there a tendency for states to pass a law, declare victory, and move on? A. I think so, and I think that’s why we need a national law. We need Congress to pass a national law banning texting and driving, and banning cellphone use and driving, but we also need good enforcement. One of the things that we did is we gave Syracuse, N.Y., and Hartford, Conn., each $200,000, and they matched it with $100,000. That was a year ago. They started writing tickets. They used the money to pay police to sit on street corners, and if you had a cellphone up to your ear or if you were texting and driving, they wrote a ticket. And distracted driving dropped dramatically as a result. Q. Two weeks ago you awarded $2 billion in high-speed rail money previously rejected by Florida. How important is it to build a robust rail network? A. First of all, I’m very happy in a very parochial way for your readers to be able to say that we gave a very, very large chunk of money to the Northeast Corridor, almost $800 million. That’s because we believe we need to fix up the tracks to get people to higher speeds and to get people on trains, and the way to do that is to improve service. People [in the Northeast] have been working on improving high-speed rail for a long time, and we wanted to reward them for their hard work and for their good plans to fix up the tracks, and for the opportunities it will provide for people to get out of their cars, get out of congested traffic, and get on high-speed rail. Q. There is a lot of talk about the state of infrastructure. How bad is it, and how do you pay for it? A. Our highways and bridges are not in a state of good repair. For the $48 billion that we received under the stimulus, we spent all that money in two years. But there are a lot of unmet transportation infrastructure needs in America. Bridges that are in a state of bad repair, roads that are in a state of bad repair. We need to continue to make investments in high-speed rail. We need to continue to make investments in transit. Transit systems all over America need the financial resources to keep up with buying new cars, fixing up their tracks, continuing to provide good service. The president has put out a big, bold plan, $550 billion over six years. So for those people who want to know what the president’s vision is, look at the plan we put out. We’re ready for Congress to pass a bill. Q. Massachusetts has a secondary seat belt law, meaning police can’t stop people unless they first suspect a more serious offense. The Legislature has a bill pending that would make it a primary law, as 31 other states have done. Is this an important campaign? A. If the Legislature in Massachusetts wants to do something to promote safety and save lives, pass a primary seat belt law. It’s pure and simple. We’ve got the statistics to prove it. The reason highway deaths have gone down 3 percent over last year is because 85 percent of the people are buckling up.